Come and join in the fun, learn more about the creatures we share our neighbourhood with as well as doing some positive practical conservation work! We have three permanent clay lined wildlife ponds that were installed last May on the south edge of Wilkies Wood to increase the biodiversity of the land we live next to. 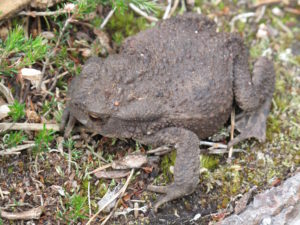 This work was done in conjunction with the national charity Froglife who part funded the project. 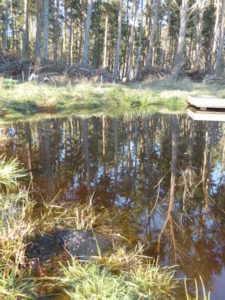 It’s time for planting the ponds up and making some hibernacula (over wintering habitats for amphibians and reptiles). Staff from Froglife will be leading and guiding us in a morning outdoor session (10am-12.30pm) and then giving us an opportunity to learn in an interactive way about pond maintenance through the seasons and survey techniques for amphibians and reptiles, including a species recording app, in an indoor session from 1pm to 2.45pm – venue to be finalised. We will end the day back at the ponds with a practical netting session to see what creatures have already colonised our ponds (3.00pm-3.30pm). If there are enough volunteers and it seems appropriate, we will also plant up an area as a wildflower meadow from free seed provided by Naturesave, one of our conservation minded insurers. Ideally we need two teams of five volunteers, one team to prepare the aquatic plant baskets with one or two helpers getting in the water to submerge them, the other team to build the four or five hibernacula which are made in a hollow from brash and other organic material which is then covered in soil. Children and the less able very welcome to come and watch and join in as and when appropriate. All tools, including nets and dipping equipment, will be provided. All you need to bring is plenty of enthusiasm, an open mind and a packed lunch. Please dress for the weather and wear sturdy footwear. We would love to have a good turn out to bring even more life to this important part of our project. Do come and engage with the land and with each other then sit back and watch how the area will grow and change over the coming years! Let our land manager, Kajedo Wanderer [email protected] tel. 07825212816, know if you would like to volunteer or need further information. This entry was posted in Get Involved.